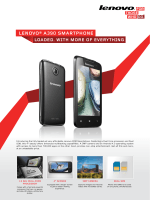 вЂў Before using the product, be sure to read Lenovo Safety and General Information Guide first. you are using other operating systems, some operations may not apply to you. 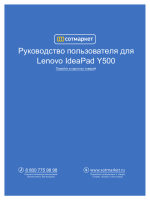 вЂў The illustrations used in this manual are for Lenovo IdeaPad Y510p unless otherwise stated. 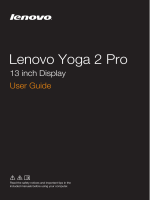 вЂў To refer to it, go to http://support.lenovo.com and click User guides and manuals. Note: The illustrations in this manual may differ from the actual product. Please refer to the actual product. The touch pad functions as a conventional mouse. clicking the left button on a conventional mouse. clicking the right button on a conventional mouse. For details, see вЂњUsing the keyboardвЂќ on page 4. Your computer has a numeric keypad and function keys incorporated in its standard keyboard. function, press and hold Fn a ; then press one of the function keys b . Opens the interface for selecting display options. Turns on/off the keyboard backlight. Connect the AC power adapter here. Note: Make sure that the ventilation slots are not blocked or else the computer may overheat. Connects the computer to an Ethernet network. Connects to devices with HDMI input such as a TV or an external display. Note: The blue port supports USB 3.0.
disconnect and reconnect the device without performing any additional steps. automatically. However, some devices may require you to install the driver before connecting. Check the documentation provided by the deviceвЂ™s manufacturer before connecting the device. notification area to remove the device before disconnecting. вЂў If your USB device uses a power cord, connect the device to a power source before connecting it. Otherwise, the device may not be recognized. вЂў When in sleep mode, you can only use the keyboard instead of the mouse to wake up the computer. phones. You can transfer data between these devices up to 10 meters range in open space. transfer speed, place the device as near your computer as possible. вЂў When you do not need to use the Bluetooth function, turn it off to save battery power. to pair the device with your computer. Listening to music at high volume over extended periods of time may damage your hearing. вЂў The yellow port supports USB 2.0.
вЂў For details, see вЂњConnecting USB devicesвЂќ on page 8.
future USB devices cannot be guaranteed. charged, connect the AC power adapter to activate. security lock that you have purchased. performance of locking devices and security features. вЂў Insert only one card in the slot at a time. вЂў This card reader does not support SDIO devices (e.g., SDIO Bluetooth and so on.). 1 Push the dummy card in until you hear a click. 2 Gently pull the dummy card out of the memory card slot. computer when the memory card slot is not in use. Retain the dummy card for future use. 3 Slide the memory card in until it clicks into place. 1 Push the memory card in until you hear a click. eject media utility to avoid data corruption. Allow air to enter the computer for cooling. Operating system interfaces ------------------------------------------------------------------------Windows 8 comes with two main User Interfaces: the Start screen and the desktop. вЂў Select the desktop tile on the Start screen. вЂў Press the Windows key + D.
available regardless of which app you are currently in. вЂў Move the pointer to the upper-right or lower-right corner until the charms bar is displayed. вЂў Press Windows key + C.
without leaving the app you are in. The Start charm is a fast way to go to the Start screen. Putting the computer to sleep or shutting it down -----------------When you have finished working with your computer, you can put it to sleep or shut it down. If you will be away from your computer for a short time, put the computer to sleep. damage the hard disk, causing loss of data. вЂў Press any key on the keyboard. If you are not going to use your computer for a long time, shut it down. and then toggle Airplane mode switch to Off. click the network name in the list, and then click Connect. Help and support --------------------------------------------------------------------------------------------------If you have any problems using the operating system, see the Windows Help and Support file. вЂў Press Windows key + F1. and support by clicking the link listed under More to explore. failure. You can also create user backups for easy restoration as required. partition by default to store the system image file and the OneKey Recovery System program files. less than the stated capacity. 1 Press the Novo button to start the Lenovo OneKey Recovery System. 3 Select a back-up location and click Next to start the backup. вЂў You can choose a back-up location on the local hard disk drive or an external storage device. вЂў Remove the removable hard disk drive before starting the Lenovo OneKey Recovery System. Otherwise, data from the removable hard disk drive might be lost. вЂў The back-up process may take a while. вЂў The back-up process is only available when Windows can be started normally. 2 Click System Recovery. The computer will restart to the recovery environment. partition before starting the recovery process. вЂў The above instructions should be followed when Windows can be started normally. Frequently asked questions ----------------------------------------------------------------------------------This section lists frequently asked questions by category. warranty service, see the Lenovo limited warranty flyer that came with your computer. Where are the installation discs for Lenovo preinstalled software (desktop software)? download it from the Lenovo consumer support website. download the latest device drivers from the Lenovo consumer support website. you need to restore the system to its factory status. What can I do if the back-up process fails? 1 Close all open programs, and then restart the back-up process. 2 Check to see if the destination media is damaged. Select another path and then try again. When do I need to restore the system to its factory status? system partition, back it up before starting recovery. provides options for setting boot devices, security, hardware mode, and other preferences. utility and set boot mode to UEFI or Legacy support on the boot menu. system cannot be installed if you donвЂ™t change the boot mode. See вЂњChapter 3. Getting help and serviceвЂќ in the Lenovo Safety and General Information Guide. - The battery pack is installed correctly. the screen, have the computer serviced. - Touch the touch pad. administrator to reset your user password. or a marketing representative to have the hard disk drive replaced. the computer, or replace the battery pack with a fully charged one. - The battery pack is charged. Note: If the battery pack is charged and the temperature is within range, have the computer serviced. the computer, then press any key or the Power button. remove the AC power adapter and the battery pack. installed and configured correctly, have the computer serviced. - The headphone jack is not being used. Discharge and recharge the battery pack. disk drive is included in Boot Device Priority correctly. charged battery pack is short. a fully charged battery pack. The battery pack does not charge. The hard disk drive does not work. Make sure that you are currently using a Windows operating system. need to free more hard disk space on your backup's partition. Your computer does not respond. AC power adapter and the battery pack. starts from the device you want. the device is included in the Boot Device Priority list. want the computer to start from. may shut down as a result. 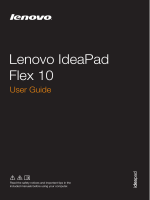 вЂў The illustrations used in this appendix are for the Lenovo IdeaPad Y510p, unless otherwise stated. вЂў The following steps about upgrading and replacing devices are the same for the Y410p and Y510p. вЂў Make sure the battery pack has been removed before replacing any devices. Replacing the battery pack ---------------------------------------------------------------------------------------Note: Use only the battery pack provided by Lenovo. Any other battery pack could ignite or explode. 1 Turn off the computer. Disconnect the AC power adapter and all cables from the computer. 2 Close the computer display and turn the computer over. Install a fully charged battery pack. Slide the manual battery pack latch to the locked position. Turn the computer over again. Connect the AC power adapter and the cables to the computer. вЂў For example purposes, this section describes the replacement of the optical disc drive module. Push the latch in the direction shown by the arrow a . Hold the spring-loaded latch in the unlocked position b .
Gently pull out the optional module c .
5 Gently insert the removable optical disc drive into the module compartment d .
6 Lock the latch by pushing it in the direction shown by the arrow e .
7 Install the battery pack. and informs you of where to find replacement instructions. Other company, products, or service names may be trademarks or service marks of others.